Bicycling outdoors is an effective way to include aerobic workouts into your exercise plan and can help prevent the boredom that sometimes sidetracks weight loss efforts. With nearly 20,000 miles of open rail-trails across the United States, you'll find plenty of places to bike. Many communities also have paved trails connecting local shops and businesses, allowing you to run errands while burning calories. A road or touring bike is meant for travel on paved roads and trails. It is built for speed, including several modifications for increasing its aerodynamics. The tires are narrow and high pressure to reduce the resistance between the bike and the road. It is also lightweight. For losing weight, the advantage of a road bike is that you can travel great distances, fast. You can commute with a road bike, which can help you work off calories for losing weight. A 150-lb. person can expect to burn about 270 calories an hour while biking at a leisurely pace -- under 12 mph. A mountain bike is a larger frame bike, built heavier than a road bike to handle the extra demands of biking off road. It has wider, knobby tires for handling rough terrain. These modifications on the surface of the tire increase the resistance between the tires and the ground. This simple difference increases the calorie burn significantly, whether you bike on the road or off. A 150-lb. person burns about 576 calories per hour on a mountain bike. A hybrid bike combines the best features of a mountain bike and a road bike. It is a good option for those who bike on a variety of surfaces. It is a middle-of-the-road version of a mountain bike, meaning it is not quite as heavy and features narrower tires. The advantage of this type of bike is that you can bike in just about any terrain. One of the most important factors for biking to lose weight is consistency. With a bike that can function in a variety of conditions, you have one less excuse not to exercise. 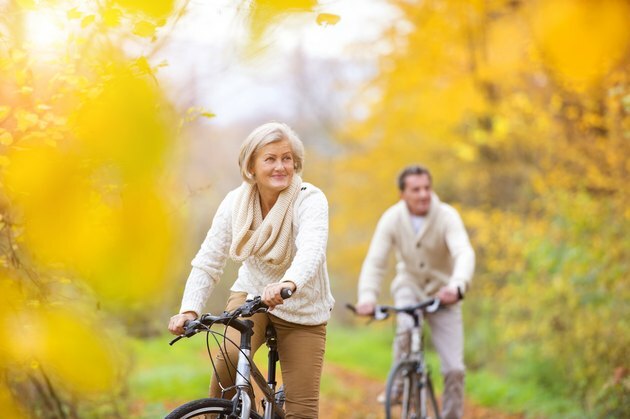 Some individuals may find biking difficult due to knee joint issues. Because of its design, a recumbent bike takes pressure off your joints. These bikes typically feature a larger seat that some people find more comfortable. The low-impact design makes it a good option for overweight individuals who want to include cardio workouts for losing weight. Biking as an aerobic exercise targets the larger muscles of your lower body, keeping your abdominals engaged to maintain balance. For an effective cardio workout, recumbent bikes are hard to beat.